Earliest railroad activity along the Lake Erie shoreline began in the early 1840s, with local investors forming the Erie & North East Railroad. 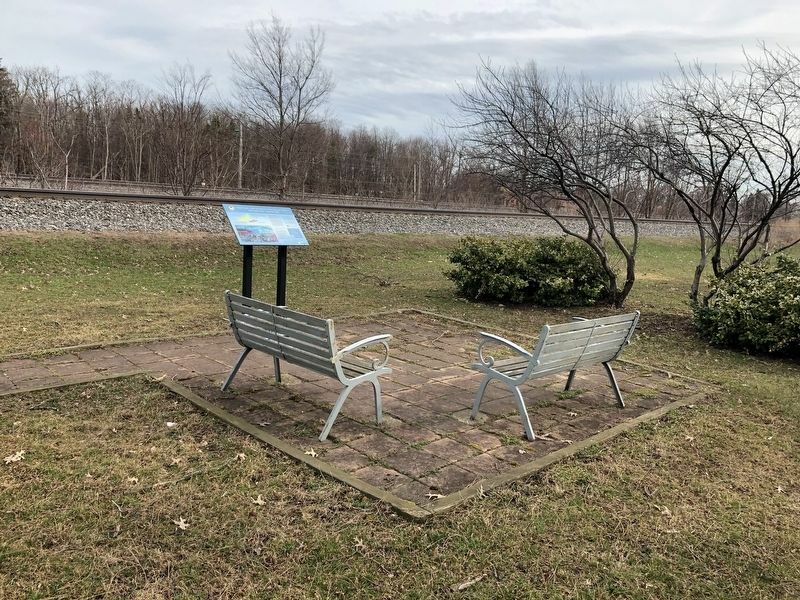 Finished in 1852, this 19-mile section of 6 foot gauge track ran from the City of Erie near 14th Street east to the NY/PA border where it connected with the 90-mile 4'8.5" gauge track of the Buffalo & State Line. To the west of the E&NE was the Franklin Canal Company Railroad. Owners of the Franklin Canal Company built a 30-mile 4'10" gauge track connecting the E&NE with the Cleveland, Painesville and Ashtabula Railroad which began at the OH/PA line. Due to the difference in track gauge, passengers and freight travelling along Lake Erie were forced to change cars twice within the county, once at the NY/PA line and once in the City of Erie. To those in Erie County, this disruption in rail travel was an opportunity to spark local industrial and economic activity. By April 1853, railroad interests in Ohio and New York realized the value of uninterrupted rail travel along Lake Erie and began to buy up stock in the E&NE with the intent to standardize the track gauge in Erie County. When the railroad began making necessary changes to the E&NE tracks December 7th, residents responded immediately by ripping them up. Repeated destruction of the rails in Erie and Harborcreek created a 7-mile break in travel and during the next two months passengers and freight were hauled between the two communities by stages, wagons and sleighs. An altercation between Harborcreek residents and railroad employees on December 27, 1853 stands out among the rest. While Harborcreek Township officials supervised the destruction of the E&NE tracks for the fifth time in three weeks, a train full of railroad officials, tracklayers and laborers arrived from Buffalo. During the confrontation that followed, Harborcreek farmer William Davidson was felled with a pick, George Nelson received a gunshot wound to his head when one of the men from New York drew his pistol, and, if it weren't for the misfiring of the pistol, William Cooper may have been the first casualty of the "war." In retaliation, Harborcreek men stormed the train, and the men from Buffalo fled the impending riot on the train with which they arrived. After January 1854, a series of court decisions and legislative acts tipped the balance of power in the railroads' favor, and by late 1856 a track of continuous gauge connected Cleveland to Buffalo; the passage of trains through the "isthmus of Erie" was uninterrupted. Hurrah, brave boys, for Harbor Creek. *This is the first stanza from a Gauge War ballad written January 1854 and reprinted by the Erie Daily Times, February 3, 1930. Location. 42° 9.57′ N, 79° 58.429′ W. Marker is near Erie, Pennsylvania, in Erie County. Marker is at the intersection of Buffalo Road (U.S. 20) and Municipal Drive, on the right when traveling west on Buffalo Road. Touch for map. Marker is at or near this postal address: 5661 Buffalo Road, Erie PA 16510, United States of America. Touch for directions. Other nearby markers. At least 8 other markers are within 3 miles of this marker, measured as the crow flies. This Fireplace (within shouting distance of this marker); Gifford-Blanchfield House (about 300 feet away, measured in a direct line); Harborcreek Area Veterans Memorial (about 400 feet away); Bryan Bell Memorial Playground (approx. 0.3 miles away); King Pavilion (approx. 0.4 miles away); We Owe So Much To So Few (approx. 2.2 miles away); John Nelson (approx. 2.2 miles away); Niagara Hall (approx. 2.8 miles away). Touch for a list and map of all markers in Erie. More. 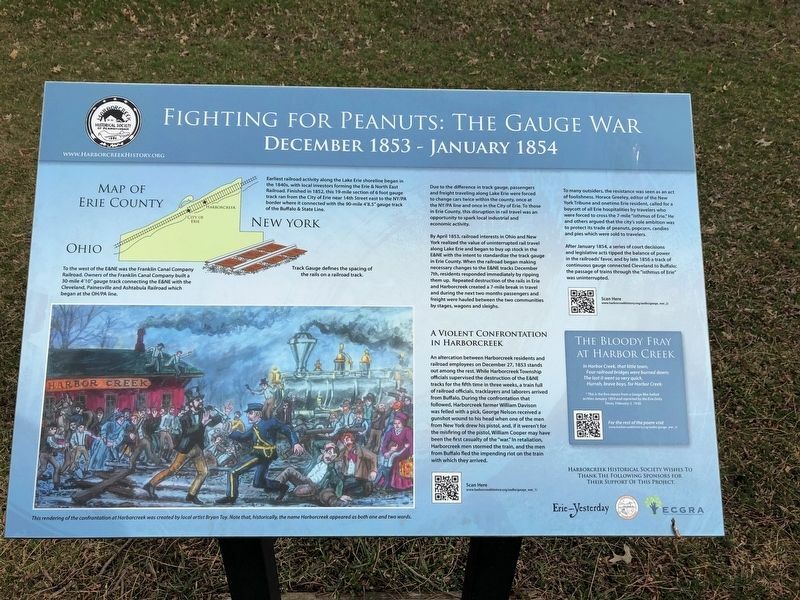 Search the internet for Fighting for Peanuts: The Gauge War.